The Shield reunited again after WWE RAW went off the air last night as Dean Ambrose came out to say farewell to the WWE fans in Canada. 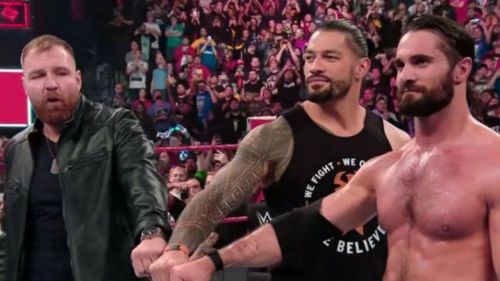 When last week's episode of WWE RAW went off the air in Brooklyn, Seth Rollins and Roman Reigns invited Deam Ambrose to come out and say goodbye to the WWE fans who had travelled from all over the world for WrestleMania weekend. The main event of RAW saw Seth Rollins and Roman Reigns team up with the newest face on RAW, AJ Styles, to take on Drew McIntyre, Bobby Lashley and Baron Corbin. After their win, Rollins and Reigns stayed in the ring for a dark segment where they invited their Shield brother Dean Ambrose to come out and address the fans in Canada. With Dean seemingly set to leave WWE soon, he addressed the fans and thanked them for their support as well as every WWE fan in the Great White North. Ambrose put over the fans saying that their energy helped the Superstars put their bodies on the lines. Dean Ambrose's WWE contract reportedly ends at the end of April but there is still some speculation that all this could be some sort of elaborate work. 5 Surprises that could happen on RAW next week- Will The Shield reunite?